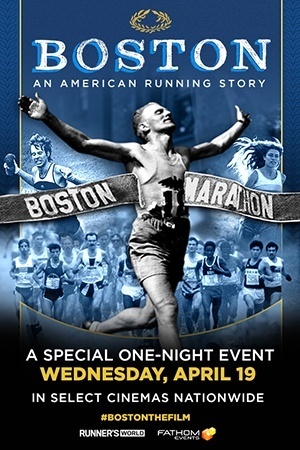 TRAVERSE CITY: Boston: An American Running Story, a documentary film about the Boston Marathon, is being shown as a special one-night event at the State Theatre in Traverse City on Tuesday, May 2, 7:30 p.m. The 2 hour and 20 minute movie is narrated by Academy Award winner Matt Damon and follows the origins of the race, once with only 15 runners, to the present day, with over 30 thousand. Following the bombing near the finish line in 2013, the film records the preparations and running of the 118th Boston Marathon one year later. The documentary received exclusive access from the Boston Athletic Association to the race archives and other rarely-seen footage from decades of race history. Boston is produced and directed by award-winning filmmaker/marathoner Jon Dunham, produced by Academy Award® nominee Megan Williams, and executive-produced by Academy Award® nominee Frank Marshall (Back to the Future, The Curious Case of Benjamin Button, Sully). “We are so excited the State Theatre and Bijou tracked down this opportunity to bring the film to Traverse City, and think it reflects the vibrancy and awareness of our strong running community here,” says Lisa Taylor, Executive Director of the Traverse City Track Club, the 501c(3) that produces the Bayshore Marathon each Memorial Day Weekend. Traverse City is one of only four theatres in the state to secure and present the film. “The film was both highly anticipated and a long time in the making, and the State Theatre and Bijou and Traverse City Track Club have had it on our radar on it since all the way back in 2015,” Taylor adds. Boston, the first full-length documentary film about the Boston Marathon, chronicles the oldest annually-contested marathon from its origin in 1896 to the 2014 race. Evolving from a working man’s challenge to welcoming foreign athletes and eventually women participants, the Boston Marathon is the stage for many firsts. Boston is presented by the Traverse City Track Club in association with the State Theatre and Bijou in Traverse City. Tickets for this special Fathom event are $15 or $14 for members. For more information contact Lisa Taylor (also check out this inspiring Traverse Magazine feature about Lisa Taylor, an icon in the local running community).